Tina Sani Legendary Pakistani Singer. 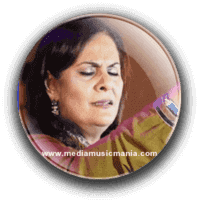 She is most popular Pakistani Classical Music, Pakistani Ghazals Music Singer. She was born on Dhaka at the time of East Pakistan, she is great Folk Music and Ghazal Singer. She created great name in Punjab Folk Music and Pakistan Music. Tina Sani got her initial Music training from Khan Ustad Nizamuddin Khan, son of Ustad Ramzan Khan of Dehli Gharana and Ustad Chand Amrohvi. She entered the professional world of singing in 1980, when producer Ishrat Ansari introduced her on TV in a youth program 'Tarang'. She shared her music journey in a session named "Classical Music Appreciation".